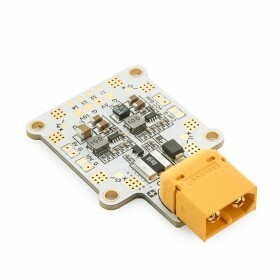 This Power Distribution Board is for multi rotor helicopters, Hexacopters, Octocopters & Y6 frames. 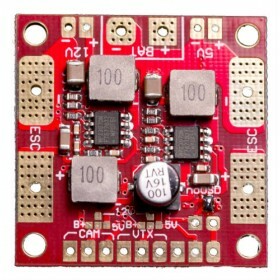 The PDB works great for any multi rotor build with 6 to 8 motors, there is a 5 volt supply from the PDB for your RC and autopilot needs that is taken from one of the BEC's on the connected ESC's. The board will be able to deliver 50A's from the box, however if you need more Amp's, you can add a layer of solder on the main tracks, this will allow the PDB to deliver much higher levels of power as needed. The Power Distribution Board is 80mm in diameter, 2mm thick with a center hole to pass wires through measuring 22mm in diameter. 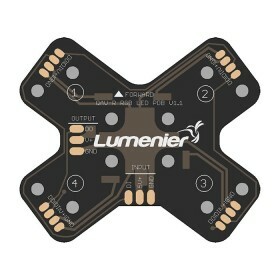 The mounting holes are spaced around the board every 17mm around the center hole which are approx 8mm from the outer edge of the inner hole. 2 pin 24 AWG cable for Power output from PDB.